The cast of ‘Neverwhere.’ Photo by Shealyn Jae Photography. 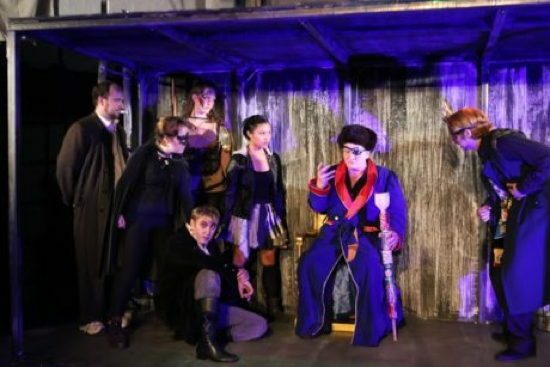 An inky, brutish and fiendish world, or should I say underworld, is revealed to lucky audience members in Cohesion Theatre’s production of Neil Gaiman’s Neverwhere. Directed by Brad Norris and adopted for the stage by Robert Kauzlaric, Cohesion’s Neverwhere is a fully immersive experience that doesn’t let up until the last shadow leaves the stage. Neverwhere tells the story of Richard Mayhew, a Scottish man living in London with a successful job and a beautiful fiancée (Wesley Poloway), who happens to be more attractive outside than inside. Richard’s life instantly changes as soon as he helps a young lady named Lady Door who lay bleeding on a London sidewalk. His altruism leads Richard into ‘London Below,’ an underworld teeming with people who have fallen though the ‘London Above’ cracks, people who are forgotten in the world above. Richard soon realizes that he is now one of those people. He must travel through London Below with Door, encountering many other curious characters and humorous situations and dialogue, in order to find his true self and to help solve the mystery that surrounds Door. Neverwhere is a fully immersive experience that doesn’t let up until the last shadow leaves the stage. Cori Dioquino as Lady Door is great for this role. Her Door is strong and focused but easily shows compassion when it comes to the safety and wellbeing of her people in London Below. And as the last remaining family member of the ruling class that has the power to open and close any door, she must find the key to locate the angel Islington to find out the truth about what happened to her family. Along for the ride is Joseph Coracle as the unlikely hero Richard Mayhew. Coracle’s transformation from a pushover to a tenacious warrior, ready to stand up for what is right, is a delight to watch. Providing the muscle on the journey is an underworld gladiator, Hunter, played by Casey Dutt. Dutt has no problems ruling the stage with her impressive fighting moves and commanding presence. Melanie Glickman as the angel Islington is fascinating to watch. Yes, she is that good, and consistently so. I read in the program that she is leaving the Baltimore area, which is heartbreaking news. She is a great talent who will be missed. Neverwhere is an ensemble piece, and the stage, lighting, sound and the large rolling crates that turn into walls, subway cars, doors and a labyrinth are each a character in the play themselves. The audience sits on each side of the width of the theatre and the stage runs down the center like a airplane runway. Every movement and every scene plays out for you no matter where you sit. Brad Norris (Director, Sound Designer) and Kel Millionie (Lighting and Set Designer) bring the black and grey stage and large wheeled crates to life with creative lighting, solid direction and great actor decisions. This isn’t one of Neil Gaiman’s books that I have read (The Graveyard Book is my favorite), so I was able to sit back and let the story unfold with no expectations. I’m sure, however, that an avid reader of Gaiman’s books will be more than pleased with Cohesion’s production of Neverwhere. Advisory: Adult language and violence. Running Time: Approximately 3 hours with one 15-minute intermission. Neverwhere plays through June 19, 2016 at Cohesion Theatre at United Evangelical Church, 3200 Dillon Street, in Baltimore, MD. For tickets, purchase them at the door or click here.